The Ford’s 2.0 EcoBoost is a 2.0-liter four-cylinder gasoline turbocharged engine with direct fuel injection. It is also called sometimes as a Ford 2.0 GTDI engine (Gasoline Turbocharged Direct Injection). Ford Motor Co. introduced the first 2.0L EcoBoost in 2010. The engine currently is offered in many Ford’s vehicles globally, such as Fusion, Focus ST, Edge, Escape, Explorer, Taurus in North America, the Falcon in Australia, the Mondeo, and S-Max in the European market. The EcoBoost family also includes a bigger 4-cylinder engine - 2.3L EcoBoost. The 2.0L EcoBoost includes two generations already. The 2.0 EcoBoost GTDI engine was significantly redeveloped in 2015. The new version (the twin-scroll 2.0 EcoBoost) shares almost no parts with the predecessor, but it is still produced by the same name while the old engine gradually replaced in all vehicles. Let's take a closer look at each of them. The engine has a high-pressure die-cast aluminum “Open-Deck” style cylinder block with high strength steel sleeves molded in the block material. The engine block is equipped with a cast iron crankshaft with eight counterweights, five main bearings (diameter is 52 mm) and damped front pulley. There are also forged steel “I-beam” connecting rods and aluminum pistons with low friction coatings on the piston skirt. The engine block has pistons cooling oil jets. On top of the block, there is a cast aluminum cylinder head with double overhead camshafts. Depends on market and application, the 2.0l GTDI engine has a water-cooled exhaust manifold integrated into the cylinder head or a conventional head with the separate exhaust manifold (it is made as one unit with turbocharger). There are four valves per cylinders – two exhaust and two intake valves (16 valves total). The engine has a variable timing for intake and exhaust valves (Ford’s Twin independent Variable Cam Timing or Ti-VCT). The intake and exhaust camshafts are driven by a single-row timing chain. The 2.0l EcoBoost features the high-pressure petrol direct injection fuel system. Each cylinder has a 7-hole injector which injects fuel directly into the combustion chamber. The high-pressure fuel pump is mounted on top of the cylinder head and driven by a four-sided camshaft lobe. The fuel pressure is between 65 and 2150 psi, depending on demand. Another key component which allowed the engine to provide such a good power output and fuel efficiency is a turbocharger. The cooled exhaust gases spin the low-inertia Borg Warner K03 turbocharger, which compresses intake air and sends it into a plastic intake manifold through an air-to-air intercooler mounted at front of a vehicle. The ignition is electronically controlled and each spark plug has an individual ignition coil. The engine operation is controlled by the Bosch MED17 ECU. To prevent the detonation, the engine was equipped with individual knock control. The throttle body is also electronically controlled. The throttle valve is actuated depending on a signal of the gas-pedal position sensor, engine temperature, and other engine control and vehicle systems such as ESP and etc. The new twin-scroll 2.0-liter EcoBoost engine debuted in the 2015 Ford Edge and now is offered in Ford Everest, Ford Tourneo, Ford Escape, and Ford Fusion. The main target at front of engineers was a more responsive and pleasurable to drive engine, with better performance and fuel efficiency in Ford’s all-wheel-drive applications than the current 2.0 EcoBoost version. The new 2.0 has a new aluminum cylinder block and redesigned aluminum cylinder head with integrated exhaust manifold optimized for the Borg-Warner twin-scroll turbocharger. The exhaust gas from cylinders 2 and 3, and 1 and 4, goes separately into each scroll of the turbocharger reducing the time needed to reach full boost. The new turbocharger also has an active wastegate, which allows accurately manage boost and torque levels. Moreover, the new 2.0l EcoBoost engine features revised fuel injectors with more precise fuel delivery, forged steel crankshaft, new pistons, higher compression ratio (10.0:1 vs 9.3:1), and an active oil control system. The twin-scroll 2.0 engine is also lighter by about 10 pounds than the predecessor. Ford’s 2.0 EcoBoost GTDI engine does not have huge problems, but still, some car owners faced some troubles over the years of production. 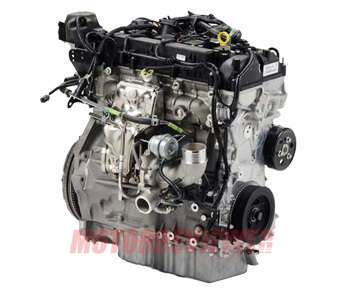 The engine with separate exhaust manifold is the leader one around consumer messages about problems with 2.0l EcoBoost engines. The main subject is an exhaust manifold itself. The stainless steel exhaust manifold is prone to cracking and further destruction at relatively low mileage (50-60k miles). The main disadvantage is that the exhaust manifold is one unit with a turbocharger, which makes the replacement is quite expensive. Failure of the turbocharger control valve is a very common problem. The engine loses power and the message "check engine" appears on the dashboard. When the ignition will be switched off and on again, the error message disappears. The control valve replacement is required to fix this problem. In the fuel system, the main source of troubles is a low-pressure fuel pump. The fuel filter in the tank is easily clogged and does not allow the pump to deliver the required pressure and amount of fuel for a correct high-pressure pump operation. A car with that issue has a bad acceleration or an unusually low limit of max speed. Failure of high and low circuit fuel pressure sensors has similar symptoms but happens very rare. You should also know that all engines with direct injection only are prone to excessive carbon buildup on the backside of the intake valves and on walls of the intake ports. To keep the same level of output performance and fuel consumption, a periodical carbon/soot cleaning process is necessary for Ford’s EcoBoost engines.